Never lend your stuff out to friends. Except maybe Pat, he takes care of them. I learned this the hard way when I lent my Garmin 200 out to a friend for a weekend. It came back with a broken usb port... Which means no charging. I'm great with soldering, but the location of the pins made it too difficult for me to get at to put another plug on it, so I decided to mount it in my car. I drive a 1991 Suzuki Sidekick. 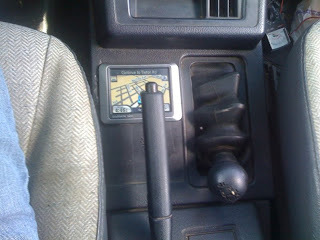 It has a nice open area below the shifter and next to the 4wd selector, So I decided to use that area. I wasn't paying much attention, so I didn't get as many pictures as I would have liked to... Sorry. 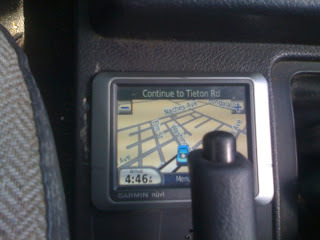 I used my trusty dremel and cut out an area for the gps to mount. Here is the back of it. Here is the part I really wish I had gotten pics for. 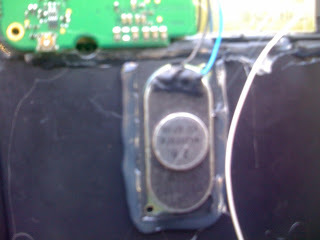 For power, I broke open a car charger for a nokia cellphone, removed the contacts from the board and soldered leads to each end. 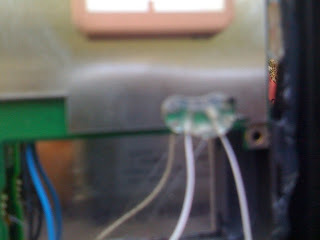 For the end that you would plug into the lighter, I took the leads and wired them up to my fuse box. 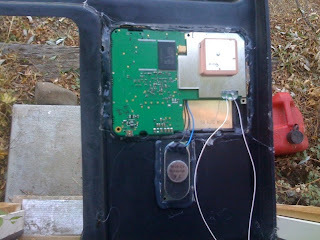 For the end going to the phone, I wired them directly to the leads I soldered to the GPS. I then put all of this inside a small project box from radio shack and crammed it under my dash. The speaker usually fits inside the back of the case, but since I was not planning on using the back of the case, I mounted the speaker under the unit. I drilled some holes for the sound to come through more clearly, and then mounted the whole thing in with hot glue. This is the finished product. I messed up a bit on the left side with the dremel, but this is ok because i plan on using jb weld to make a seal around the bezel, which I will sand down and paint to make it look like it came with this stock. The unit works quite well. I have already used it on one long off-roading trip i took a week or so ago and it performed flawlessly. 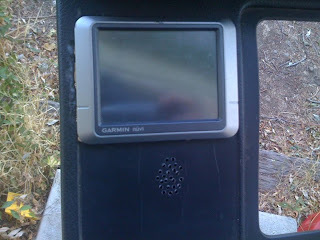 I've got a Garmin Nuvi and now I know what's inside one. Fitting it into my car would be a fun exercise but I'm a tad bothered someone might break in to steal it.